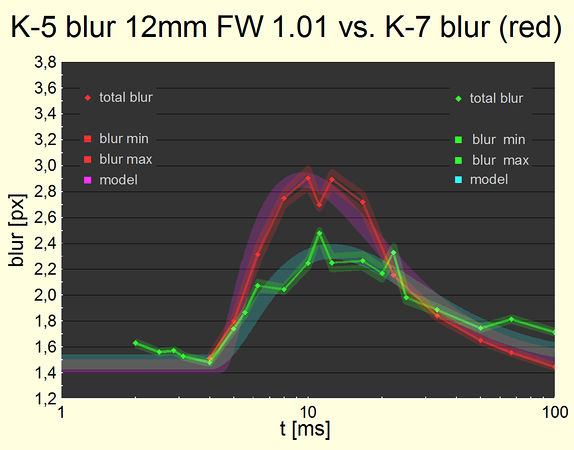 Total blur widths as a function of shutter speed for a Pentax K-7 camera (red) and a Pentax K-5 camera (green). Our recent study of shutter-induced blur for the Pentax K-7 SLR camera has created a lot of buzz in the Pentax community. We are now actually watching to see similiar work been done for cameras of other vendors too. In a nutshell: Pentax may not have changed much. But the little they changed helped. The increase of blur due to shutter operation (the amount which the image blur increases by at certain shutter speeds) is almost halved with respect to a K-7, at least at the most critical speed around 1/80s. You may see this from the chart as depicted above as well. On average, the K-5 shutter induces a pixel blur increase by less than a pixel which should not be noticeable in day to day work. Normally, the increase is less due to other sources of softness or by not shooting at the shutter speed where the effect is largest. Also note that every camera with a focal plane shutter (every SLR) will exhibit a certain amount of shutter blur for physical reasons. We are not surprised to see the issue of shutter-induced blur for Pentax mitigated in the K-5. After all, the previous study for the K-7 was in reaction to numerous complaints and for the K-5, the first user feedback is very positive, incl. sharpness at the critical shutter speeds. The shutter-induced blur in the Pentax K-5 is measurable but it should be small enough to be of no concern in day to day photography. The absolute magnitude of the effect sits halfway in between a K20D which has almost no measurable effect and a K-7 which exhibits an effect large enough to make some people notice in their work. The matter may now have reached a satisfactory state with the K-5. But there remains work to be done for Pentax to fully understand and eliminate any unnecessary effects which compromise image sharpness. It would be interesting to test another camera with fast shutter (like a D300s) to compare the absolute magnitude of the shutter blur effect which is never zero. Esp. at ~1/160 s. Ideally, vendors would measure it and make part of their cameras' shutter specification. Thanks for the report ! Well Done and Good Job, Falk. This let Pentaxians know how K-5 would be for one of the major issues of the K-7, finally! Thanks for this work, Falk; I'm glad to see the blur is unlikely to be an issue for most photographers. I'll be linking to this article in my ongoing K-5 review. I came across it the other day and wanted to know what you thought. I think you disproved the low-pass filter on SR around 1/80 recently, but I haven't seen any test data at telephoto length to back it up. Do you have any data at say the 200-300mm range? All of tests I've seen have been at the 50mm focal length, which makes it hard to test judge SR effectiveness past 1/100s. In my blog, there are two 2010 articles (Shake reduction revisited, April; Shutter-induced blur, June). The former is basically made obsolete by the latter and needs an update. In the June article, you find efficiency data for SR beyond 50mm (in one big chart). E.g., at 300mm, efficiency is pretty good across the range down to 1/500s. I would say 2 stops but better look at the chart yourself. The sribd article is from Peter Smith and it is cited in the June article. We even use his data in one chart to compare with his work. Please if posting anonymously, choose a nickname for your post. Thanks. This blog is about photography, or more generic topics which may or may not be accompanied by photos or movies. Photography is my passion. I started as a teenager in 1977 and with a Pentax MX. And I am still discovering new subjects and new ideas for my photography. My goal is the image which intrigues a beholder's curiosity. © Falk Lumo ... Awesome Inc. theme. Powered by Blogger.